Since 1941, Upham Woods has been a place where people gather to explore and experience the natural world. Early on, programs with Ranger Mac and Marvin Hanson introduced 4-H and school groups to the unique geology and forest communities of the area. Nature study was a main component of the program. Today, the emphasis continues with even greater focus, as environmental issues have grown on a local and global scale. The activities at Upham Woods are designed to encourage youth leaders to address environmental issues with the goal being the development of caring and responsible stewards of the natural world and its inhabitants. Upham Woods’ programming focuses on both the natural and cultural history of the Wisconsin River, with topics ranging from the French Voyageurs of the Fur Trade, to finding archeological artifacts from the 1800’s Dell House, to exploring the sandstone caves of the Dells. Through Upham Woods’ educational programming, youth obtain a unique view on how Wisconsin has changed ecologically and culturally. 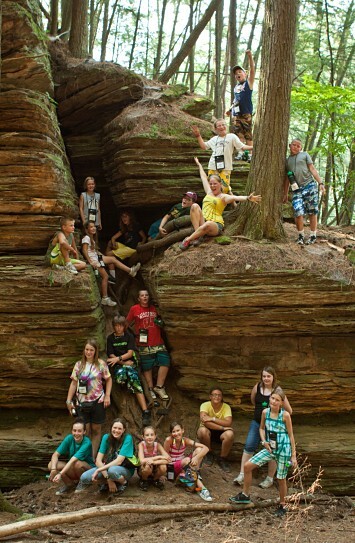 Youth are encouraged to explore Wisconsin’s past to discover valuable lessons that will enable each of us to better plan for the future of Wisconsin and the world. Today, as you visit Upham Woods you will find a model residential environmental education center, operated by the University of Wisconsin – Madison Division of Extension. The center sits on a prime location on the Wisconsin River, two miles north of the Wisconsin Dells, offering an excellent “river classroom” to study the both the natural and cultural history of Wisconsin. The center rests on 310 total acres of forested land, including a 210-acre island called “Blackhawk Island.” This island has been designated a state natural area and offers a beautiful example of a mature mixed forest featuring flora not commonly found in the area. The island also has tremendous sand stone caves formed during the ice age. It’s definitely a “different view” when you climb through them! The facility consists of 14 buildings including a fully equipped nature center and a raptor enclosure housing educational birds of prey. The center supplies lodging for 200 people, meals, and environmental education year-round for youth and youth leaders, including environmental lesson plans, summer camp programming, leadership workshops and other conferences. Upham Woods employs full-time teaching naturalists that live on-site all year long.